Engineer Chris Tarr is no stranger to the industry – known to some as the “Ninjaneer” for his ability to swoop into a station and quickly get to the bottom of a problem at all hours of the day and night, Chris has been tackling the engineering challenges of Wisconsin radio stations in the Madison and Milwaukee markets (among others) for a number of years. 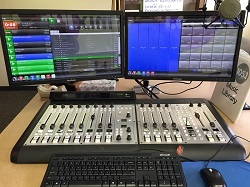 We had a chance to talk with Chris about a few of his past projects, and his most recent project installing an Axia iQ console and other hardware for WMHX at Entercom’s Madison station cluster. ST: So where did this particular project begin, Chris? CT: First, a bit of background… this station started as a “Jack FM” type of format with no on-air staff. 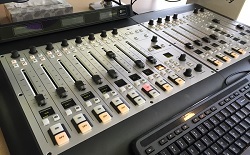 We had originally built the studios around 2005 with a very basic analog console, just enough to get on the air. Well, recently the station changed format. We figured it was a good starting point to jump into Axia at this location. The rest of the stations and studios here are still analog for now but we had to start somewhere. Eventually the plan is to move all of the studios here to Axia. ST: Can you tell me a bit about some of the deciding factors for going with Axia in this installation? CT: I had installed Axia consoles at other stations and found that we could go with Axia for just a bit more than the price of a really nice analog console. There is a lot of added value in the Axia consoles though – not just the price. Added value like being able to control the system remotely and configu re profiles for shows is important when it is one engineer maintaining six stations across multiple locations. The first decision here was exactly which console to go with. At other locations I had installed Element consoles, but they would have been overkill for this particular installation. The iQ was a perfect fit. When we looked at all we could do with the iQ, including replacing some existing analog audio switching, it was kind of a no brainer. I mentioned added value with these consoles – one of the coolest “hidden” features of these consoles is the VMIX function. It’s almost like getting a free console or audio switcher along for the ride. When you’re a small station, that’s pretty powerful. These little 5 input mixers don’t have to be directly associated with a particular station’s functions – they can be used for anything. For example, we’re using a VMIX for ad replacement on a web stream. We had previously been doing that with an external audio switcher. Another feature we’re looking forward to is integrating the phone system with the console. ST: How long did it take you to complete the project? Were there any unexpected challenges along the way? CT: Well, the most difficult part of the project was actually removing the old console and wiring! It took me a couple of hours to do that. I had the new console up and running in about 30 minutes. It’s a whole different world. I wouldn’t do it any other way now. The DJs noticed too – the other stations in the building started asking when they were going to get their new consoles! The Milwaukee site is entirely Axia and we’re working on that for Madison now. That’s another cool thing – you can build the system in stages. We’ve finished one studio in Madison and we’re eventually planning to do three more. You don’t have to be “all in” right away – you can start with some core infrastructure and slowly build from one studio to many. ST: So how long have you been using the Axia consoles? CT: Not terribly long – I specified my first Axia install at a station shortly before I started working at Radio Milwaukee in 2012. Since then, I must have installed 10 or 11 in various locations by now including both iQ and Element consoles. It all started when we lost an old analog console to lightning. The cost of replacing that console was going to be at least 50% of the cost of going to Axia. Although I’m kind of an old school analog guy, once the first console was set up and I started playing with it, things started to make a lot more sense. I really started to realize the power of the system… it kind of blew my mind. We had kept an analog studio up and running at first “just in case,” but it turned out not to be necessary. ST: What else have you noticed since moving to Axia? CT: There were a couple of things that really impressed me – first, so far it has been “future proof.” I was still able to install the latest version of firmware on Radio Milwaukee’s oldest console engine. Second, once I really started using tools like iProbe and Pathfinder, I was sold. I’ve been able to log in from home and change routes on short notice. This is the sort of thing that would have required a drive into the station and some manual audio patches in the past. I’ve also made pretty heavy use of show profiles. 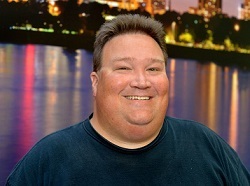 I had set up a profile for the morning show guy but noticed that there were a few things that he still changed every day. Once I talked to him about the way he wanted to work, I was able to capture an updated profile the next morning with just a few clicks before I even got to the office that day. Our job is to make sure the operators can do their job. Ask them how they like to work and adjust things accordingly so they don’t even have to think about it. It just works the way they want to work. This is how we as engineers can help ratings – make it so the operators can just do their job and produce content. ST: Anything that you would say to someone who is “on the fence” about moving to digital and AoIP? CT: What are you waiting for? When you come from a purely analog world, it does take a little bit to wrap your head around everything you can do, but everything that used to take two or three steps is now boiled down to 1 and happens automatically. My biggest challenge was that I kept making it harder than it needed to be. It really is a whole new paradigm for radio. 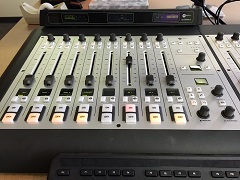 There are fewer and fewer engineers for radio stations these days – anything we can do that makes the management of audio easier, I’m all for. Thanks for the chat, Chris.